The rule for marital property in South Carolina is that the marital estate, assets and debts, are to be divided in an equitable manner. This means that the division of property and debts between the divorcing parties should be fair and equitable, but not necessarily equal. There is no fixed standard to divide property, each case will be decided on its facts, and the trial court’s discretion will not be disturbed on appeal without a showing of clear abuse. The division of property must be graduated according to the particular facts and circumstances of each case. The court may divide jointly owned property according to the equities of the case. It may award property to one spouse that was owned during the marriage by the other spouse, it may award property to one spouse even that was owned during the marriage by the other spouse’s corporation, and it may order property sold to bring about an equitable division of marital property. Misconduct matters. The court’s discretion extends to a ruling awarding the wife a little less than half of the husband’s estate, considering evidence that the husband had engaged in misconduct. It also extends to a decision to give the wife virtually all the marital estate, in view of the short length of the marriage (3 ½ years), evidence that the wife had contributed the property, and evidence that the husband had abused her. It does not extend, however, to an award of about 30 percent of the marital estate to the wife, given her status as a homemaker during most of a lengthy marriage, given that the marital residence was built on land she inherited, and given that significant funds invested in the marital residence came from the sale of other land she had inherited. However, misconduct probably matters less than most people expect it does. Remember that the facts that seem so shocking to you may not be shocking at all to the judge, because he or she has already heard about this sort of thing several times this week. What effect does the length of the marriage have on marital property division? Generally, property division involving a short-term marriage is relatively straightforward. When few or no joint assets have been accumulated, the tendency is to "unwind" the marriage. This means giving back to the husband and wife what each of them brought to the marriage, both assets and debts, and dividing up in some fair way the assets and debts the parties Giving back to, that is, to return the parties to the financial position in which they arrived at the marriage. The more the parties have "co-mingled" their assets, however, the more difficult this "unwinding" may become. In distributing property after a longer term marriage, the judge's tendency will typically be to begin with something like a 50/50 division of the marital estate. They'll depart from that 50/50 standard, though, sometimes fairly dramatically, depending on their judgment about what is equitable under the circumstances. Is there such a thing as separate property? Generally, separate property acquired before the marriage or by gift or inheritance during the marriage may be excluded from the marital estate if neither the property nor its income has been used for the common benefit of the parties during their marriage. So where a wife exercises exclusive dominion and control over property and excludes the husband from any role with it, and where the husband derived no benefit from the property by virtue of the marital relationship, the property is considered the wife’s separate estate. However, where the parties regularly use property acquired before marriage for the common benefit of the parties, it is available for consideration in dividing property. One exception to the gift exclusion is gifts from one spouse to the other. In South Carolina any gifts from one spouse to the other is considered marital property. Usually this takes the form of jewelry. It is in dealing with the marital home that courts often fall back on the principle that they are to devise an equitable distribution, not necessary an equal one. Courts can get creative in dealing with the family home. For example, the wife may be awarded the "use and possession" of the home for a period of time, or for her life. Or she may be given the right to stay in the home until she remarries or until all the children reached the age of majority, whichever happens first. Marital property includes all real and personal property the parties acquired during the marriage and owned as of the date of filing or commencement of marital litigation. S.C. Code Ann. § 20-3-630(A) (Supp. 2009). "The doctrine of equitable distribution is based on a recognition that marriage is, among other things, an economic partnership." Mallett v. Mallett, 323 S.C. 141, 150, 473 S.E.2d 804, 810 (Ct. App. 1996). "Upon dissolution of the marriage, property acquired during the marriage should be divided and distributed in a manner which fairly reflects each spouse's contribution to its acquisition, regardless of which spouse holds legal title." Id. The ultimate goal of apportionment is to divide the marital estate, as a whole, in a manner that fairly reflects each spouse's contribution to the economic partnership and also the effect on each of the parties of ending that partnership. Johnson, 296 S.C. at 298, 372 S.E.2d at 112. (15) such other relevant factors as the trial court shall expressly enumerate in its order. S.C. Code § 20-3-620(B) (Supp. 2009). These criteria are intended to guide the family court in exercising its discretion over apportionment of marital property. Johnson, 296 S.C. at 297, 372 S.E.2d at 112. The family court has the discretion to decide what weight to assign various factors. Greene v. Greene, 351 S.C. 329, 340, 569 S.E.2d 393, 399 (Ct. App. 2002). The factors are only equities to be considered in reaching a fair distribution of marital property. Johnson, 296 S.C. at 297-98, 372 S.E.2d at 112. South Carolina Marital Property Case Law Good Discussion on Separate Property and Transmutation. Pensions and retirement benefits earned during the marriage are marital property and subject to an equitable division in a divorce. Usually this is fairly straightforward division unless it is a military pension which is discussed below. If it is a division of a regular retirement plan, a separate court order called a qualified domestic relations order or QDRO is required to be drafted and approved by the judge and the plan administrator. Click on the link below for a full discussion on QDRO's. Special rules apply to military pensions and the exact wording can make a huge difference. If you or your spouse is a military member, you need to be sure to retain a South Carolina divorce attorney to protect your rights. Tirado v. Tirado, 530 S.E.2d 128 (Ct. App. 2000. 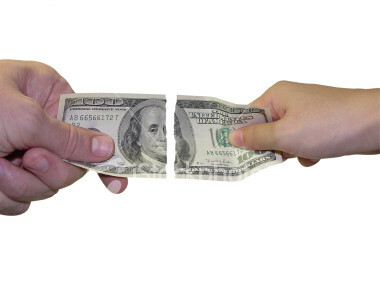 Is the wife entitled to reimbursement from the husband for the reduction in her monthly Defense Finance and Accounting Service (DFAS) checks due to his postdivorce waiver of retirement pay in favor of increased disability benefits? Price v. Price,480 S.E.2d 92 (S.C.App. 1996 Did Husband breach his obligations under the Agreement by unilaterally reducing Wife's equitable apportionment of benefits acquired during marriage. One thing that many people overlook after a divorce is the necessity to change their estate plan. Failure to do so can subject your estate to a lawsuit from your ex spouse. Please see our article on preparing your estate plan. Wayne is a family law attorney including probate, elder law, trusts, personal injury and South Carolina divorce.